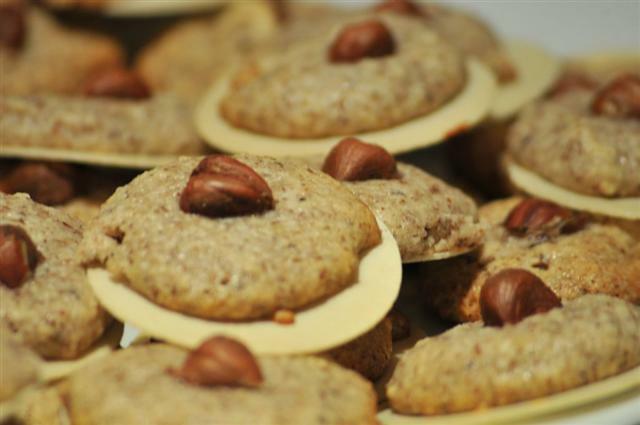 The German Hazelnut Macaroons (in German "Haselnussmakronen") are traditional and classic German cookies for the Holiday season and Christmas. Germany is known for its unique and delicious Christmas Bakery. If you have not made any German Christmas cookies before, than this recipe is very good to begin with. In Germany we use very thin wafers for these cookies but they might be not easy to get in the USA. The recipe works also without them. Happy Baking! - Preheat oven to 300 degrees F.
- Add sugar; sieve it over the firm egg white and carefully mix it. - Then add the hazelnuts and cinnamon and mix it carefully (don't use the mixer, use a wooden spoon). If you cannot get ground hazelnuts or hazelnut flour, you can use a coffee grinder to grind them. - Dust a baking tray with flour or use baking paper. - Place on each wafer with 2 teaspoons a small amount of hazelnut batter and place in the middle one half of a hazelnut (or a small whole one). - Bake them for 10-15 minutes depending on the oven. Check frequently, you don't want the wafers become brown. If you want you can bake them without the wafers too. Instead using wafers for the bottom you can use melted chocolate and dip the bottoms of the baked macaroons in it briefly.